Journal Of A Petite Diva: PHARMACISTS IN THE HOUSE. WHAT WOULD HAVE BEEN YOUR RESPONSE? PHARMACISTS IN THE HOUSE. WHAT WOULD HAVE BEEN YOUR RESPONSE? Hey Pharms in the house, i saw this article on dailymail.co.uk and it is an interesting case considering all that we know as pharmacists. I would love to hear your opinion on whether you think what the pharmacist did was right and what you think would have been your own reaction. A 14-year-old girl died in the street after a pharmacy refused her a life-saving adrenaline injection when she suffered an allergic reaction to peanuts at a Chinese buffet. Emma Sloan was denied an EpiPen shot - a special allergy injection - which by law, cannot be obtained from a chemist without a prescription, the Herald reported. It was reported on RTÉ that the pharmacy regulatory body, the Pharmaceutical Society of Ireland, is examining the case. The teenager told her mother that she became unable to breathe after eating satay sauce in a Chinese restaurant in Dublin, it was reported. Caroline Sloan was said to have asked a nearby pharmacist for an EpiPen injection which would have released adrenaline to Emma, but the pharmacist said rules forbade them giving out the pen without a prescription. Ms Sloan, from Drimnagh, Dublin, was about to take her daughter to Temple Street Hospital in the city but Emma died on the street surrounded by a crowd, according to reports. She appealed to parents of children with nut allergies to always carry an EpiPen. ‘I was told to bring Emma to an A&E department. Emma was allergic to nuts and was very careful. How could a peanut kill my child?’ she told the Herald. 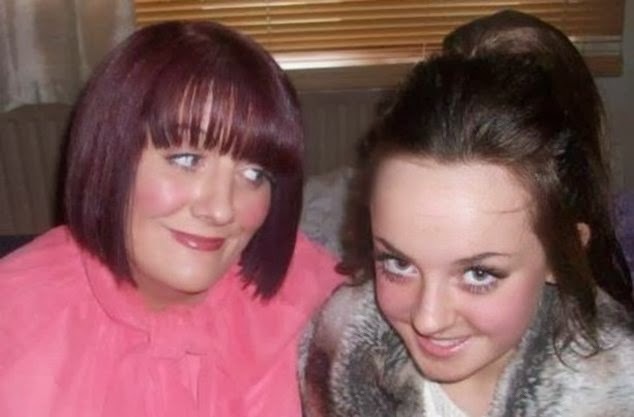 The mother told how she and Emma, along with her other daughters Amy, 20, and Mia, 2, and Ms Sloan’s sister, Susan, had gone for dinner on Wednesday at 6.30pm. The teenager, who had a nut allergy, ate satay sauce, which contains peanuts, but Ms Sloan said they had thought it was curry sauce. ‘It looked and smelled like curry sauce,’ she said. ‘I’m not blaming the restaurant because there was a sign reading 'nuts contained' but it wasn’t noticed. Moments after eating the sauce, Emma is said to have told her mother that she couldn't breathe. Ms Sloan said they left the restaurant and went around the corner to a nearby chemist. Peanut allergies are often diagnosed in children who are less than two years old. Currently in the UK, one in 100 people suffer from an allergy to the nuts, with the majority suffering the affliction for life. An allergy to peanuts is the most severe of all food allergies, with the symptoms of a reaction triggered by a tiny trace of peanut protein. Peanuts provide a cheap source of dietary protein and so they are commonly used in a wide range of products. Currently there exists no treatment for the allergy and sufferers with a severe form are forced to avoid nuts altogether. The Department of Health advises that for children under the age of three, whose parents have a history of allergies, also avoid peanuts. As with other allergies, a peanut allergy, is caused by an over-reaction of the body's immune system to the protein. When a sufferer is struck by a reaction they typically develop a rash on the face or body. Sneezing, coughing and choking, wheezing and having trouble breathing are also symptoms. Severe reactions are known as anaphylatic shock. Anaphylaxsis can be fatal if it is not treated. While there is currently no cure for a peanut allergy, sufferers can carry a pre-loaded adrenaline injection, known as an EpiPen. And antihistamine can be used for more minor reactions. EpiPen's contain a single dose of epinephrine, which is injected into a sufferers thigh muscle. My Thoughts: First of all knowing that the child was allergic to nuts they should never have left their epipen at home. Then i can just stress that they were careless in not asking about the content of the food. But as they are humans, they can forget. No human is above forgetting things. Now to the pharmacist, i believe in all countries, the focus is the patient. I doubt the mother would have asked for epipen desperately without reason or on credit. Since they said the child was on the street, it won't have taken much for the pharmacist to have followed the mother to the child and later gotten a prescription from the child's doctor when the child has been stabilized or even the doctor that was passing by. But then again i really don't know how strict the laws are there. However i really do hope that if i was in that kind of situation in that country i would have given it regardless of the consequences. So over to you guys? What do you think?